**A princess in a tower. A prince hidden at birth. The townspeople call her the Tower Princess, but Gressa's life is no fairy tale. She's never understood why she's been separated from the rest of the kingdom, but now that she's older the pieces are coming together. For too long she's been trapped in her brother's scheme to find a way through the magical wall dividing their kingdom in two. She doesn't expect any help from the prince to the south, even if he did manage to bumble his way to her rescue. If she could pick anyone to form an alliance, it would be the squire she watches train from her window; he shows promise. But, confined to her tower, there's nothing she can do...or is there? One day a hole opens up in the Dividing Wall and with it, a chance for Gressa to change everything. If you like classic fairy-tale stories and sweet romance, then you'll love Gressa and Manny's desperate quest for rescuing their kingdom. 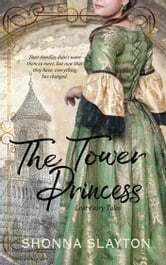 Buy The Tower Princess and start reading this new fairy tale today.